I personally find the combination of dark hair and blue/green eyes the most attractive. Gosh no. She looks like wrinkly old bag. Her face seems very "wonky". I'm 24 years old and look very young for my age anyway. Got blonde hair though it's actually quite dark now, blue eyes, manly chin, large shapely lips (for a guy), straight nose, also 6'3" tall, I'd describe myself as pretty good looking but when you look at the types of men women go for here it's surprising, they like the neanderthal look with lots of hair, short stocky stature, sloping forehead, ew. Personally I go for blue eyed women with very dark hair, dark brown or black. LOVE that combination. Last edited by Weatherfan2; 08-15-2012 at 07:49 AM..
As a life-long blonde, I am distressed when I see brunettes dying their hair blond. It's certainly NOT a "how dare you try to be like me" thing, as some will surely assert . But it bothers me because they somehow think they have to go blonde to be attractive or something, and that is not true. If a woman is darker skinned and has dark eyes, then very dark hair looks beautiful on her. But when such a woman bleaches her hair blond, it just looks tacky and sad. I feel especially sad for black women who bleach their hair blond. Just have beautiful black hair and love it! Blond is not necessarily better looking by any stretch. Blond hair is NOT rare anymore; it's everywhere. Look around. But NATURAL blond hair is still rare. A lot of people have blond hair as children but it darkens as they get older. I'm an oddity in that I'm 43 and still have natural blond hair (never colored it, ever). I guess I just wish people would be confident enough inthemselves to stick with their natural color, or maybe just "tweak" their natural color up or down a little, instead of going to the extreme and going severely blond or bright red. Redheads (natural ones) are probably as rare or maybe more rare than us natural blondes). And for the record, apart from my childhood identification with all the Disney movie characters (in my earlier post), I've NEVER felt that blond was superior. The stories that people are sharing here are really about women who were egotistical b*tches, who happened to be blonde. That attitide has nothing to do with blond-ness. Really? That's funny because the content of your post actually proves otherwise. Just saying. How so? I'm saying blonde is not necessarily more attractive than othe rcolors. I'm saying women with dark hair are beautiful when they embrace their natural color. If anything, I'm saying with regard to hair color, natural anything is superior to fake anything. 1) You are assuming that people dye their hair blonde because they believe it to be "better" than their natural color. Some people just like to change their look and it has absolutely nothing to do with believing blonde is "better". If a woman is darker skinned and has dark eyes, then very dark hair looks beautiful on her. But when such a woman bleaches her hair blond, it just looks tacky and sad. I feel especially sad for black women who bleach their hair blond. Just have beautiful black hair and love it! Blond is not necessarily better looking by any stretch..
2) There are people with darker skin that have naturally blonde or even red hair. Particularly people of mixed racial heritage. I have had schoolmates as a child who were natural redheads or blondes and they are Black or biracial. 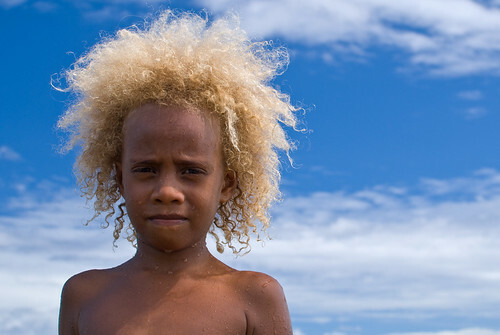 I have even seen mixed race Asian kids with blonde hair. So blonde hair is not an attribute exclusive to fair skinned Caucasians. So there really is no need for you to feel "especially sad" for Black women with dyed blonde or red hair. 3) Does it bother you that blonde hair is no longer "rare" or that its everywhere? Seems so. 4) Again, someone who choses to dye their hair a different color is not automatically lacking "confidence" in their natural color. I think you're reading into my post things I never stated or implied. 1. Yes, I assume that when people dye their hair any color, it's because they believe the new color is more attractive than the previous color. Why is that wrong to believe? Some people change their hair color a lot, even to things like blue and purple, but if they didn't like the way it looked, they wouldn't do it. At some point, the woman decides, hey, "chartreuse would be more attractive than teal." I guess the exception would be someone who is a performer dying it for a role, or perhaps someone who only dyes their hair to "make a statement" like "I'm a rebel." But that also speaks of the person's self confidence. 2. If someone has that color hair NATURALLY, then I would never consider it tacky or sad. It's when someone feels compelled to do something totally unnatural looking in order to think they are attractive that it beciomes sad. The women of color who happen to have blonde or red hair do not look unnatrual at all. But a dark skinned woman with bleached platinum hair looks unnatural. Often such women would look so much more beautiful with black hair, and that's the color it was originally before they started messing it up. As an example, I went to high school with a girl who was Italian, and she had beautiful olive skin, dark eyes, and long dark brown, nearly-black hair. she was one of our class "beauties," guys loved her and girls admired how she looked. At our 20 year reunion, she had yellow-bleached blond hair. Yes, that was "sad" and I'll maintain that position. Her hair was clearly unnatural, frizzy, yellow-brassy-orangy looking. It used to be luxurious, silky-looking, shiny, and dark. Evidently, she got the weird notion that "blondes have more fun" or that guys would like her more if she went blond. She told a few people she had made the change a year or so earlier when she got divorced and started online dating. How can that NOT be sad? She was not confident enough in her natural beauty, that she had to resort to something not natural and not very beautiful. I have poker-straight hair, and most of my life, I had "curl envy." I loved curly, wavy hair on other people. when I was a teen and even in college, I got perms. Ya know what? That was sad. Permed hair never looks as good as naturally curly hair, and it was obvious that I had a perm. I finally came to the conclusion that people look their best when they've embraced and even enhanced what they've been given naturally rather than try to change it. 3. No, it does not bother me whether natural blond hair or bleached blond hair is rare or not. I was born with a certain type of hair, and I embrace it. I prefer natural over fake, but even if 99% of the populations were blond, I would not be "bothered." It's so funny to me that you would even think that about me, since I tend to prefer to melt into the background and NOT be noticed or stand out. It's not important for me to be rare or to stand out at all. And as a reminder, I called myself an "oddity" for being naturally blond in my 40s; that's a few points away from "freak." It's not like I called myself a rare gem or something! 4. Um, yes, I think that in most cases that is the case. Again, apart from the people who dye their hair for an acting role, or the people who dye their hair "odd" colors just to shock people or to stand out as rebels (these are probably not a huge portion of the population) most people who color their hair, any color, do it because they prefer that new color over their natural color. Why would anyone think otherwise? I've never heard anyone say "I'm going to get my hair colored tomorrow because I think the way it looks today is way too pretty!" or "I just had all my grey covered up because it was so attractive!" They pick a new color because they think that color is better than what's currently sprouting out of their head. Apart from the very few b*tchy blond women that other posters have described here, I don't believe that any blondes, as least since the dissolution fo the Third Reich, think that they are "superior" because they are blond. I really think it's a projection from non-blondes who just can't embrace their naturally beautiful dark hair. they might meet a stuck up woman who happens to be blond, and instead of just deciding she's stuck up because she's a narcissist or spoiled, they decide she's stuck up because of her hair color. Judge people based on the content of their character and not the color of their hair. Apart from the very few b*tchy blond women that other posters have described here, I don't believe that any blondes, as least since the dissolution of the Third Reich, think that they are "superior" because they are blond. I really think it's a projection from non-blondes who just can't embrace their naturally beautiful dark hair. I need to amend this. I just remembered a girl I knew in college, 20 years ago now. She gravitated toward me in class, and we ended up hanging out a few times, then we ended up both doing our psychology field placements at the same place. She was also blond, and would frequently bring up how we both had naturally blond hair, and how that was "special," and how she always thought other girls were "jealous" of her for having blond hair. She was really a whack-job (that's an esoteric psychology term). I soon determined she had some serious personality-disordered problems and distanced myself from her. Later I heard she got kicked out of the field placement because she's been overly flirtatious with both the staff and patients in the psychiatric hospital we were working at. So yes, there might be a few people who think we blondes are "superior" but they are whack-jobs. This phenomenon has many very plain looking, and even ugly men and women thinking they are attractive. Most are just average. I don't get the excitement about blond hair and blue eyes. I think it's personal preference. I know mine is towards brunettes. I dated a few blondes when I was younger, but over 75% of the women I dated were brunettes. Here's a bland brown hair and brown eyed girl. Now here she is with bottle blond hair and blue eyes, what a difference!!! It seems some of you people have it out for blond hair blue eyed people because they rejected you and didn't welcome your advances. Now you're complaining about those people on the board which makes you pathetic. Wow! I had no idea Hilary wore blue contacts!! Jeez...even with all of that effort Sarah Palan still looks better. So is it just as sad and depressing when a woman with light hair or "dishwater" hair dyes her hair a rich brown, auburn, or even black? Because I see this all the time and it never bothers me as a natural brunette. People like to change their look up, and look at all of the unnatural looking brunettes out there. Celeb examples are Katy Perry and Megan Fox. as far as black women go, I have to say one of the most beautiful woman I have seen since moving to Boston was a half black half white woman who had bronze skin skin, was 5'8", and had golden highlights. It was magnificent and that's coming from a straight woman. Careful when you make that judgement. 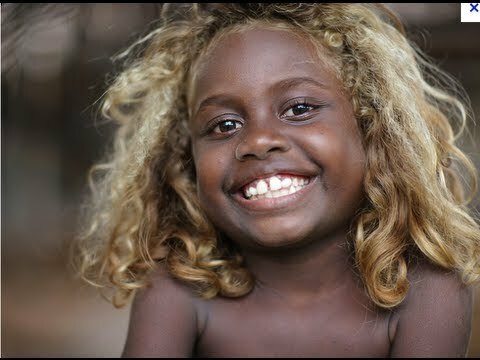 You'd be right most of the time, but even dark skinned people can have naturally blond hair.